YOU DRINKIN’ OR LOOKIN’ is a permanent display of the Wine Wing. The exhibit gives focus and feature to Kuba wood cups. 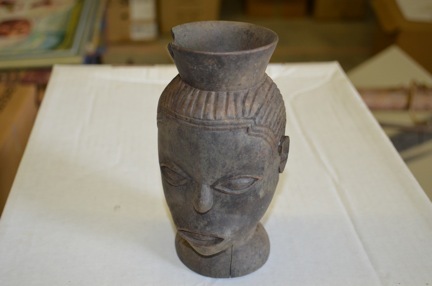 On display is a Kuba cup proudly,personally,and respectfully chosen from the Southern University at New Orleans Bertrand Collection of African Art. The ancient culture of the Kuba has its beginnings in the early 17th Century, and their artful cups precede the Age of The King. Today the Kuba take their place among and belong to the south-central Democratic Republic of Congo. Kuba is known to be a wealthy state rooted in a system of courtly titles and military rank. The Kuba, African Kingship wood cup is one of the most artistic,exciting,eye-catching drinking vessels in the world. Wood cups are commissioned as symbols of status and wealth. These wonderful works of identification art can instantly establish heritage,hierarchy,and lineage upon site within and among African culture. 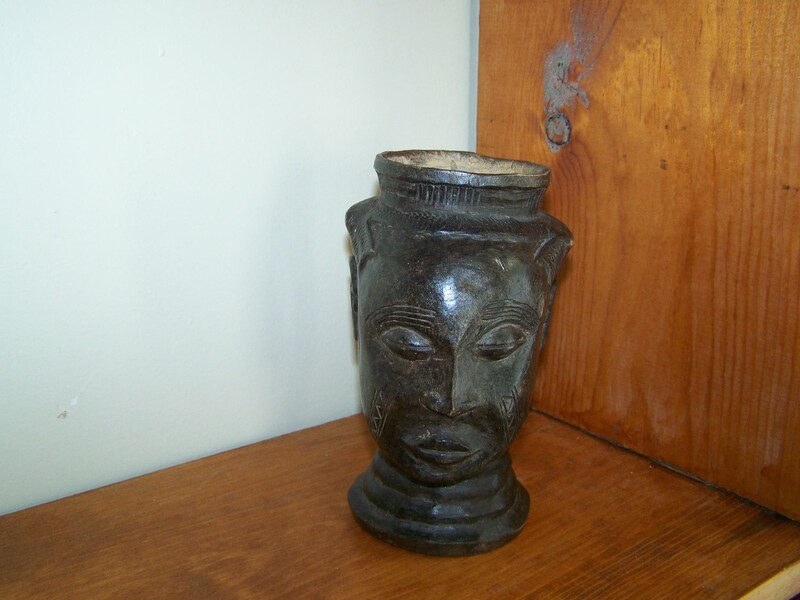 Kuba cups are not common because they are fashioned to accompany royal costumes and antiques.These cups are also known to be the prestige objects of prominent statesmen,monarchs,diviners,and chiefs. They have also know to have been used as currency for payment in matrimony negotiations and court settlements. Most often used for drinking and distributing Palm wine as a display in sharing of wealth,these cups are exquisite and are skillfully crafted examples of Central and West African art that represent reverence and power. These carved cups can take on very familiar characters and characteristics that embrace spiritual beings of heaven and earth. Kuba cups in elephant form pay homage to Woot, the Kuba’s original king ,who is believed to have created their world. Wood cups created by the Kuba are fit for kings and may be fashioned into faces but are not intended as portraits of specific individuals, yet still convey important information about identity. Kuba cups in the forms of heads are usually prized possessions of rulers. Distinguishing characteristics of Kuba cups from other clan styles are the attentions given to specialization, detail, design, texture, shape, size, and color. The Bushoong ranks high among all Kuba Kingdoms and their cups are often the most elaborate in design and decoration because of their social, economical, and religious status.